I began playing keyboards at the age of eight, when my father brought home a chord organ. I quickly discovered that by using only three of the chord buttons to the left of the keyboard, I could play "Louie Louie". Those three chords were apparently the basic secret to rock and roll! It wasn't long before I discovered how the notes on the keyboard could be used to play a melody over the chord pattern. I then began experimenting on the piano. At the age of thirteen, I got my first portable keyboard: a Farfisa Compact Duo combo organ. Once I had that, I was jamming with friends in my basement on songs by bands such as The Beatles, Stones, Steppenwolf and Iron Butterfly. 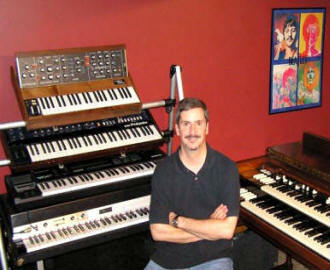 In college, I purchased a Micromoog synthesizer and Hohner Clavinet D6 to add to the Rhodes piano. I soon began playing in funk and fusion bands. It was around this time that people started calling me "Keyboard" Keith. Up until then, I had been called a lot of things. In my junior year at Kent State University, the rhythm section of my funk band, "Night Train Express" merged with three horn players from the Kent State University Jazz Lab Band. We became "Northstar" and began playing regular gigs on Kent's famed Water Street as well as around Cleveland and Akron. We soon gained a reputation for our punchy horn section, funky rhythm section, as well as for our charismatic lead singer, the late great Darrell Campbell. The band was popular for its covers of songs by Tower of Power, Weather Report, Frank Zappa, Billy Cobham, as well as for its originals. Northstar twice opened for renowned jazz guitarist, Larry Coryell in 1978 and 1979 and jammed with him live on stage on both occasions. After graduating from Kent State in 1980, I played in a series of top 40/lounge bands in the Cleveland area as well as on the road. By the mid-80's, I quit playing full time and took on day jobs, first at a specialty keyboard and pro audio shop, Pi Keyboards & Audio, and in the early 90's at Lentine's Music. Co-workers at Pi included former Dazz Band keyboardist, Steve Cox (who went on to play for Wynona Judd, Trisha Yearwood and Garth Brooks); and Trent Reznor of Nine Inch Nails. While at Lentine's Music, I twice played with Rock and Roll Hall of Fame inductee, Cars guitarist, Elliott Easton, for Gibson Guitar clinics. In various bands, I have been the support act for Larry Coryell, former Commander Cody guitarist, Bill Kirchen and the late great Chicago bluesman, Carey Bell. I now have a career unrelated to music but still play about 40 to 50 gigs a year with The Recyclers, Jump the Gun and Neil Young tribute, Harvest. I hope to see you in the clubs!